It’s D-Day for the US Presidential Race. The race to the oval office between Donald Trump and Hillary Clinton has been a closely monitored affair the world over. It’s like watching a drama, thriller, comedy and documentary all rolled into one – just that it affects the real lives of Americans (and the rest of us too). 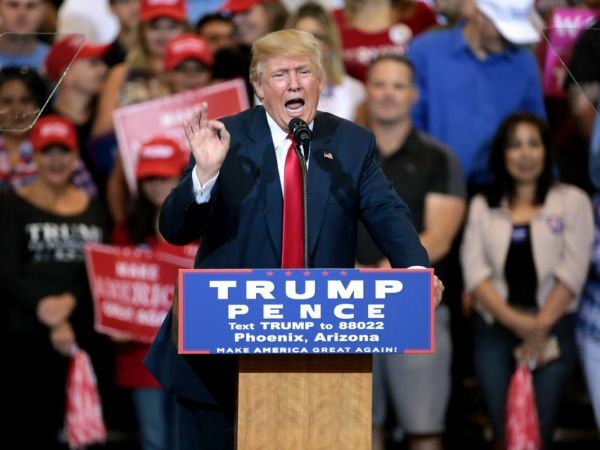 Over the weekend in his last rally before Americans went to the polls, Donald Trump took to the stands in Tampa, Florida to address his supporters. His main agenda? American jobs. When one thinks of countries in Asia which have seen a large influx of American companies setting up local bases in the past decade or two, places like China and India always comes to mind. This is mainly due to the manufacturing sector relocating to these countries, given that operational costs are lower. Trump then laid down the stats as to how much America has lost. 70,000 factories was moved away from America, especially after China entered the World Trade Organisation, and he called the “the greatest job theft in the history of the world”. He then proceeds to call out individual companies who were guilty of this ‘theft’. First on the chopping block was Goodrich Lighting Systems who moved to India, laying off some 255 Americans. Singapore was next in line to the firing squad, as Trump singles out Baxter Healthcare Corporation for laying off 199 workers in their move to the little red dot. And last was Essilor Laboratories, who moved their operations into Mexico, leaving 181 Americans jobless. 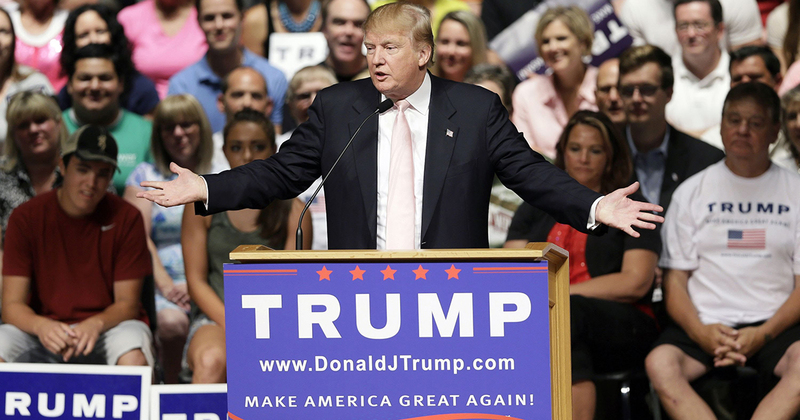 Donald Trump is ultimately a businessman, and his latest venture is for the seat of the US presidency. Recognising that tensions regarding the lack of jobs are high among Americans, he played his cards right, promising to protect their jobs and reign in companies, should he be elected. As Trump delivers his speech mentioning Baxter and Singapore, many would have thought that this was some recent occurrence, and that Baxter now has zero presence back in its home country. A quick check on Baxter’s corporate page still lists their headquarters being located in Deerfield, Illinois, with a manufacturing plant in the same state at Round Lake, while their other US plants are scattered throughout the country. Overall, they employ over 65,000 employees who are spread over 100 countries. In Singapore, Baxter actually has been around since 1978. Here’s a little history lesson, thanks to the Economic Development Board. 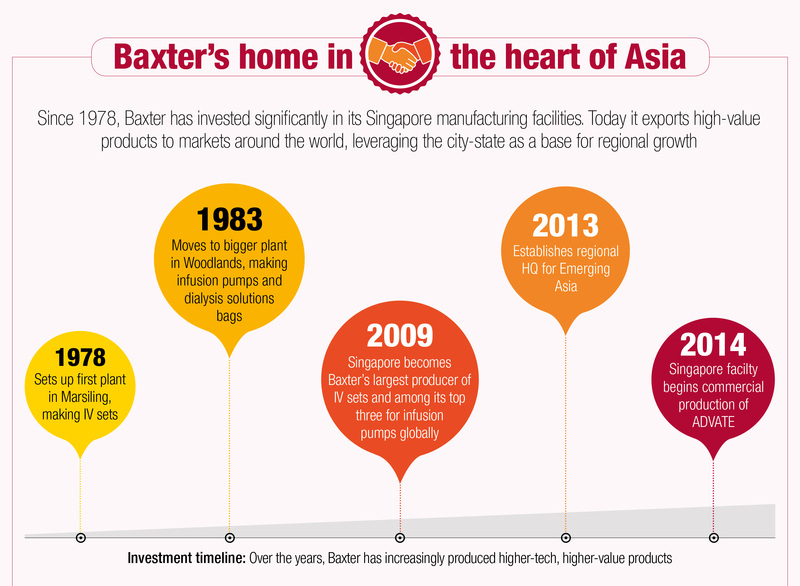 Baxter marked their arrival in Singapore with their first plant in Marsiling, and through the years, expanded its capacity in the country significantly, where it sits now at Woodlands. The Baxter plant in Singapore is one of their largest globally, and are shipping their products to some 61 countries. 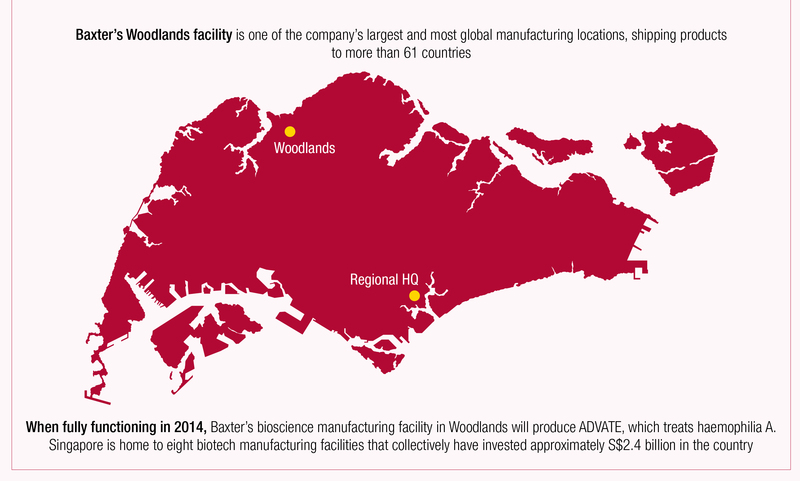 Singapore is also home to Baxter’s Regional Headquarters for the Asia Pacific region, which supports their other plants located in Australia, India, Philippines, Japan, and China. As of 2014, the manufacturing plant houses 400 staff in its premises and was projected to have grown with an additional 450 hires by the end of 2015 due to the opening of their Baxter Bioscience Facility. Did Trump Blow Things Out Of Proportion? Mudslinging of his rival candidate aside, many have questioned the necessity to even mention Singapore. Sure, it had put us in the global spotlight for those few seconds, but many couldn’t help but laugh, considering how our country is just a miniscule proportion to not just the USA, but to the state of Florida where he was speaking at. 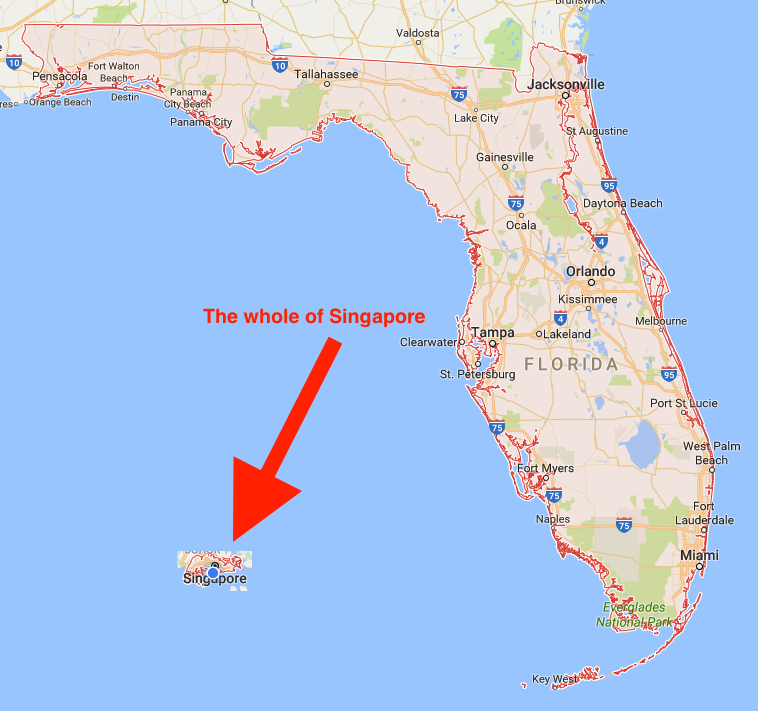 Mashable even did a geographical comparison between Singapore and Florida to demonstrate how ludicrous it was, along with some comments left by people on social media regarding the matter. Singaporeans need to only look at their social media news feeds to see peers reacting to this bit of news about Trump and Singapore. 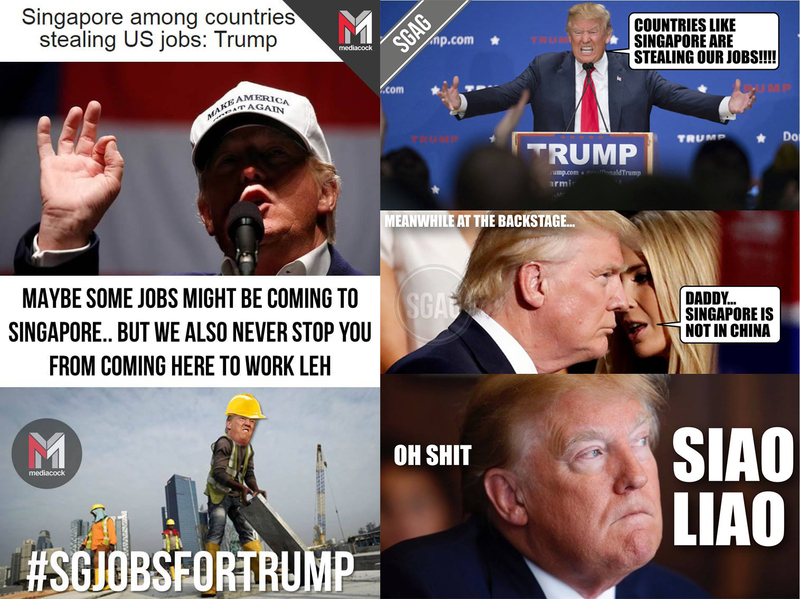 Some of Singaporeans’ favourite local meme pages also had a field day with this ‘revelation’. 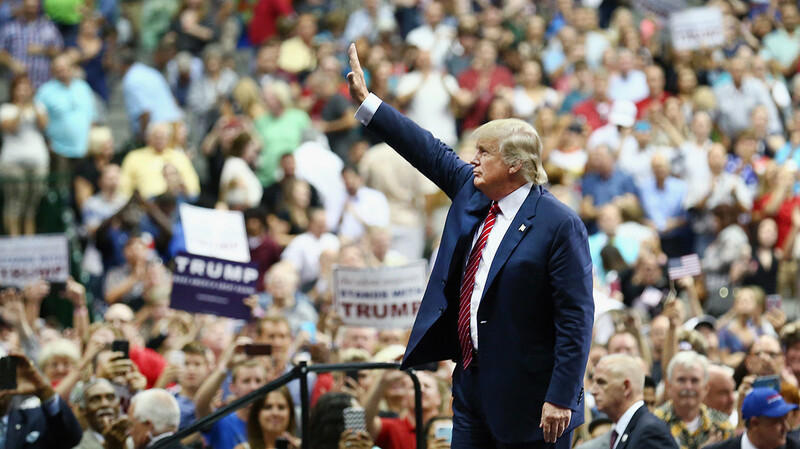 All laughing matters aside though, as of the time of this writing, Donald Trump has commanded a sizeable lead over Hillary Clinton, and according to estimates by the New York Times, is well on his way to becoming the next elected president of the United States. As stock markets worldwide start their decline due to the news, it seems, though, that the boardroom of The Apprentice will soon be coming into the White House. If you would like to hear Singapore’s 10 seconds of fame thanks to Donald Trump, watch the video below – we come on around 1:48:32.